Words, words, words. Will the words ever end? What we need to pep up this page is a nifty infographic. You know what they are even if you don’t know what they’re called—an infographic is a visually appealing, mentally intriguing and concise presentation of data via graphic representation. Oh, look! 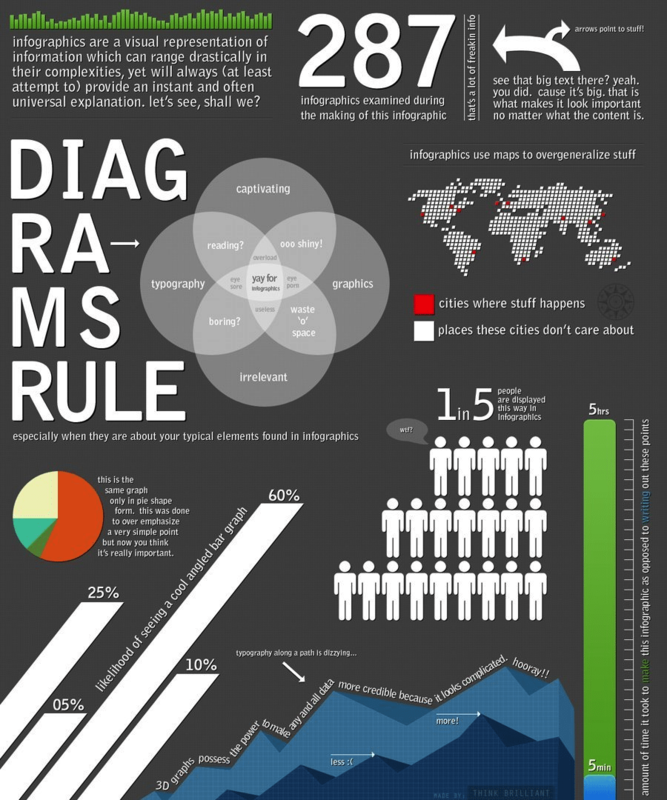 An infographic on infographics by infolicious. (Explore more visuals like this one on Visually). Maps, graphs, flow charts—all of these structures are easily imprintable on our visually-tilted brains. Text is also visual, true, but words, as symbols, are clunky to process compared to pictures. It’s like digesting roughage versus the instant sugar rush of a honey stick. Images are processed some 60,000 times faster in the brain than text. It should come as no surprise that we gather 90% of our information visually. Although there are four commonly identified learning styles (visual, auditory, tactile and kinesthetic) Most of us (65%) are visual learners. Infographics are unparalleled in their power to form a clear message from raw data without in-depth analysis or nuance. They are visually enticing, provide a handy short-cut to mental mapping of information and are easily shareable on social media. 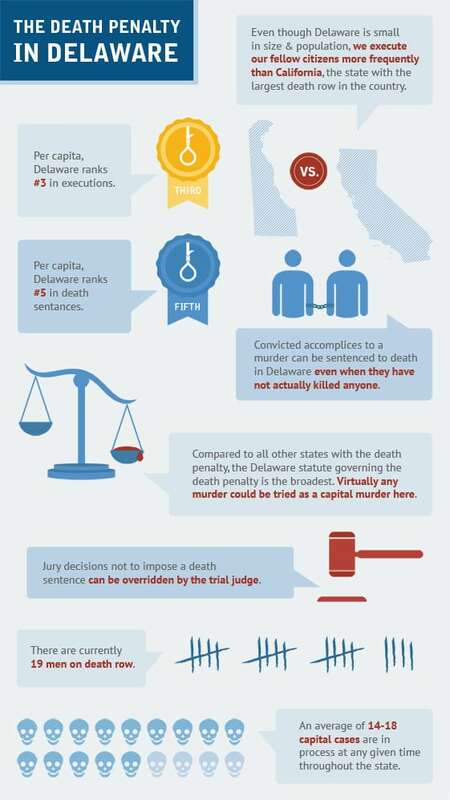 Take a gander at this infographic we created for the ACLU of Delaware. Now imagine the same information in paragraph form. You just lost a good portion of your readers. It’s sad but true—Internet readers are a fickle, easily bored, slam-bam kind of lot. Bullet points would help immensely, but even bullets are tedious compared to an infographic layout. A good infographic, like a good story or persuasion speech, includes a beginning, middle and end. Start with a clear title, shore up the title with at least four supporting statistics, and conclude with a call to action. The infographic above was created for a website, with the call to action nearby. But if you’re planning to share on social media, make sure you’ve got (1) a clear call to action; (2) a copyright crediting your organization; (3) your website’s URL. Creating infographics is not one of those skills, like playing the harmonica, that you just sit down and figure out all on your lonesome. They demand keen technical, graphic and compositional skills. Happily there are apps for that including several of these free online infographic-making tools. Canva: This wildly popular online software couldn’t be easier to use with simple drag and drop design. We have tried and love Canva, and highly recommend it to clients. Easel.ly: This user-friendly app gives you a dozen free templates and the tools to design your own infographic on their website. All you do is choose a template; drag icons around (arrows, shapes, connector lines, stick people); edit content, color, text style and size; save and share. Visual.ly: A community platform for designers and infographic clients alike and a fantastic place to scroll through a gallery of infographics . Also great for organizations with the budget to commission an infographic from a professional designer. They’ll start from ground zero (research and data collecting) or can get involved much further along in the process. Choose an interesting topic, ideally with data you’ve collected yourself or data that has not been cited exhaustively already. Title and subtitles are important – what is the story you’re telling? Your infographic should come to a conclusion or trumpet a call to action. Always embed your organization’s website url in your infographic. 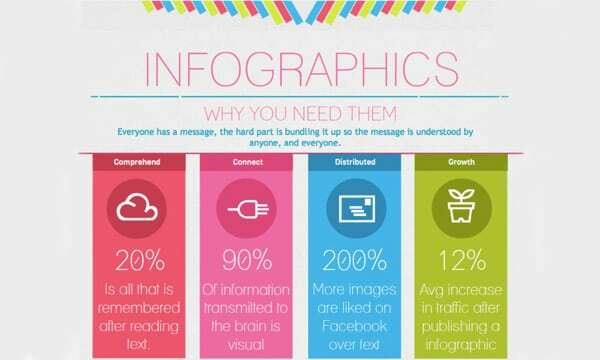 Remember that infographics can spread like wild fire; take advantage of their viral nature to bring attention to your organization. As usual, anything super popular is subject to satire. To wit: an infographic about the sometimes predictable gimmicks of infographics from the Huffington Post.